The Miletus Group, Inc. is committed to building real and lasting architecture. This is a big statement, but really such a statement boils down to a commitment to utilize quality design principles as well as quality materials and craftsmanship. A simple concept, yet it remains an illusive reality in most production housing. To achieve our objectives, we have a design team that includes architects and engineers whose expertise spans many disciplines. This expertise includes residential design, New Orleans vernacular, urban design, traditional building methods and modern building systems. Why would we bring this depth of knowledge to the design of a house? The answer is, in a word, 'Quality'. Frank Lloyd Wright once quipped that “The physician can bury his mistakes, but the architect can only advise his client to plant vines”. As this quote alludes, it is best to get it right the first time. We do not believe that the expediency of a post-Katrina environment should alter the New Orleans cultural tradition of getting buildings right. We are directing our energies to inserting our homes into a long and honored timeline that is New Orleans’ long history of building unique and special homes and places. The Miletus Group’s Shotgun House has all the outward characteristics of a traditional shotgun. Inside, however, it has all the design, engineering and comforts of a modern home. The floor plan is a straightforward shotgun plan with large open living and dining areas facing the street. The house incorporates a full size kitchen and bathroom. An optional walkthrough room and a private bedroom complete the plan. The home has nine-foot ceilings and tall windows in classic New Orleans configurations. Interior finishes are fine quality and include options for wood, tile and carpet floors. The walls are painted gypsum board, and lighting and other details are carefully considered and enhance the simple yet charming character of this house type. A variety of interior and exterior finishes are available. On the exterior, durable and code compliant materials are used to provide for longevity and survivability during strong wind events. The interior can have a variety of finishes and depends on the buyer’s taste and budget. At the buyer’s option, these homes can be fully outfitted with all finishes and appliances. Traditional building methods in dense urban environments often result in a harsh and intrusive process. The normal patterns of urban life can be disturbed by increased traffic from job site workers, heavy equipment, and the associated dust and noise. Implementing systems-built modular construction in the urban realm removes a substantial amount of the work normally done on a job site and places it within the controlled environment of a factory. Work at the building site then becomes a much shorter process of component assembly instead of a the long drawn out process of traditional on-site construction. Using modular construction makes the interruption to urban life minimal and the time to occupancy rapid. These pages contain architectural drawings illustrating several architectural styles that we have developed for this project. 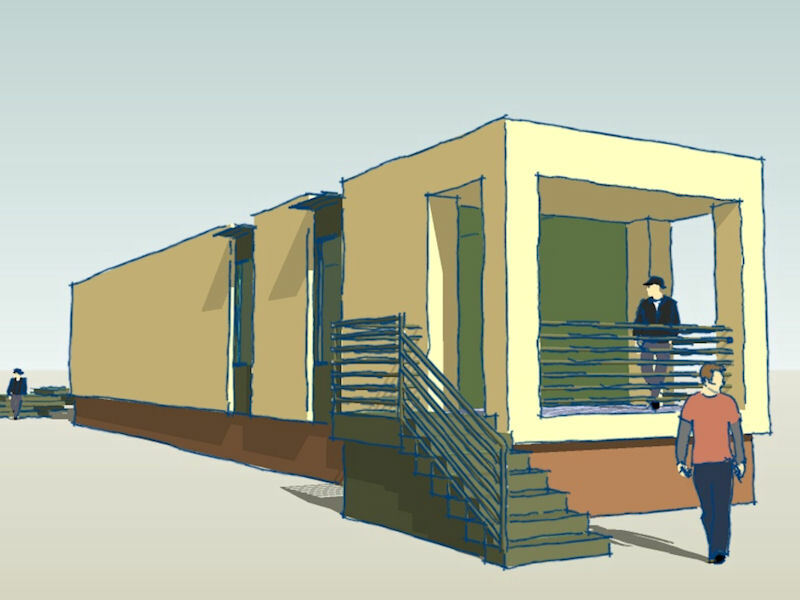 These drawings are only samples of what is possible as the Miletus Group’s Shotgun House is very flexible and can be customized to a variety of styles and details. The siding and roofing samples shown here are a small sample of possible exterior finishes. Most standard building products can be used. Many more options are available. 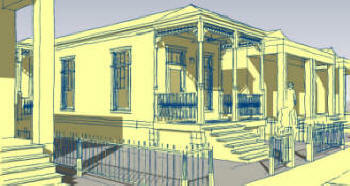 The Shotgun Single is based on the traditional narrow plan of the historic Shotgun house. It has a front porch, living room, dining room, large kitchen, two bedrooms and one bathroom. Forced air heating and air conditioning are included in approximately 880 square feet of living space. It is nearly 14 feet wide and is designed to fit on lots as small as 20’x100’. As a part of the Shotgun family, we have included a design for a classic Double Shotgun or Duplex Shotgun. Each unit in the Double is identical to the Single Shotgun. While both units of the Double can be rentals, this unit type is included in our project because it provides a special opportunity to offset the costs of home ownership by including secondary income property in a single structure. This is a common housing type found throughout New Orleans. Each unit in this Double is approximately 880 square feet. It is designed to fit on a as small as 34’x100’. Expanding the basic Shotgun, this model includes a ‘saddlebag’ like addition to the plan. It is a larger home built of the same materials and quality as the Single Shotgun. Also like the Single Shotgun, it includes a living room, dining room and kitchen. There are four bedrooms, one of which is a master bedroom suite. There are two bathrooms, a laundry/mud room, and a front porch and screened back porch. It is approximately 28 feet wide and provides just under 1600 square feet of living space. This home can be built-out all at once or the addition can be added to the Single Shotgun later. This completed home is designed to fit on a 34’x100’ or larger lot.